With this in mind a group of four would look good, and so three more were required which I produced concurrently. “Inside the Old Cinema” was the final one completed and appealed to me as the colouring of the figures sort of resembled some classical painting. It was adapted from a grainy i-phone photograph, which I had taken in the remains of the old Odeon cinema in St. Albans on an open day to promote the new Oddysey cinema. 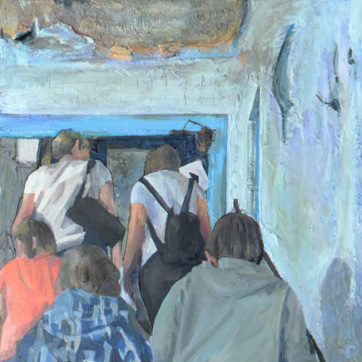 It depicts young people ascending the staircase from the stalls up to the foyer area. The cinema is built on a steep sloped bit of land, so the main entrance at street level is in line with the circle, so one had to descend to the stalls, or more recently the three other screens of the subdivided cinema. I like the fact that the kids depicted were probably not born when the cinema closed, yet because of the open day had the opportunity to have a relationship with the structure. They could be “the famous five go exploring”. They almost seem oblivious to the decay around them – but I think that just adds interest. I’ve tried to stick with the same language as “Last chance for Screen Three” as in the building itself is textured using modelling compound while the figures and detail are flat canvas. I’ve also used strips of cardboard to define the doorway frame and the door in the side wall, and numerous pieces of canvas defining the peeling ceiling and wall surface. Are they all related? Are they just friends? I love it when a picture posses more questions than it answers.